Heena is a Program Manager with Aavishkaar, where she manages the technical assistance facility (partnership with KfW) and has a keen focus on developing start-up ecosystems. Prior to joining Aavishkaar, Heena was working as a management consultant primarily engaging with start-ups in the sustainability industry, based in Boston. She has led a variety of projects including research, stakeholder engagement, partnerships, operations & training with some of the notable, award-winning start-ups like Sustainability Roundtable, Sustainability Accounting Standards Board(SASB) as well as organizations like IBM, Northeastern University, HSBC. 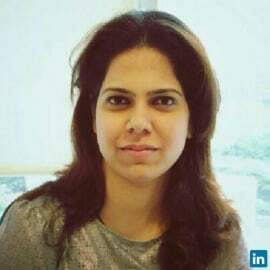 Heena has an MBA from Hult International Business School, an MS in Finance from Goldey Beacom College and a project management professional(PMP) certification.